Elektra is a character in Marvel universe who has been portrayed as both a villain and anti-hero. Elektra began as a villain and love interest of the Marvel hero Daredevil. She has grown in popularity appeared in numerous titles and two movies. Her full name is Elektra Natchios but is known by her first name. 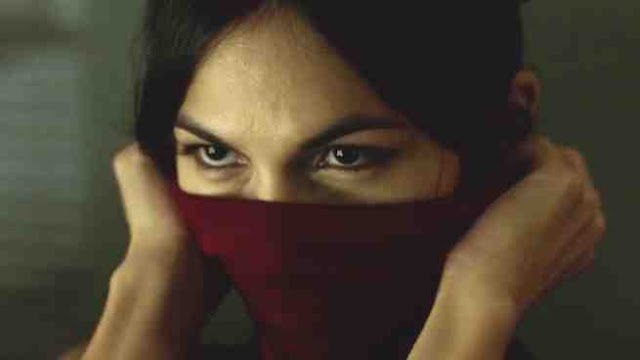 Elodie Yung will play Elektra in season 2 of the Daredevil Netflix series. Elektra was played by Jennifer Gardner in the film Daredevil as well as the follow up picture Elektra. Neither film was part of the Marvel Cinematic Universe. Frank Miller created and ironically killed off Elektra during his famous run on Daredevil. He has asked for the character not to be brought back or used. Marvel obeyed this wish for a time keeping the character dead for many years however has since resurrected the character. Elektra's mother is killed by assassin as she is born. She is raised by her well to do father Hugo Natchios along with her older brother. As a child she is attacked by assassins and this time they are killed by her brother who is a martial artist. Her Father decides that Elektra must learn to defend herself and places her in intensive martial arts. The family moves to NY when her father lands an ambassador position. Elektra goes to college in NY and begins dating fellow student Matthew Murdoch. Unknown to her Matthew moonlights as the street crime fighter known as Daredevil. Her life is sent into turmoil when her father is assassinated. Not wanting to be prey Elektra leaves New York and seeks out one of the greatest martial artists a blind man known as Stick. Stick runs a group called the Chaste who use martial arts but are effectively non violent. Stick sees a darkness inside Elektra but agrees to train her. He hopes he can remove the darkness from her person. He succeeds in making a stronger martial artist but fails in making her a better person. She leaves the Chaste to find darker and more violent martial arts trainers. Elektra initially joins up with a group of Ninja called the Hand. They train her into one of their best operatives. However, when leaves the group to become a solo mercenary the Hand want her dead. She becomes one of the assassins of the Kingpin. She battles Bullseye to decide who will become the Kingpin's primary assassin and he kills her (Daredevil #181). Elektra remained dead for a quite awhile. It is said that Frank Miller the creator and writer of the Daredevil series never wanted her to come back. She has now came back numerous times however. Elektra died again in the New Avengers series and this time her body reverted into the form of Skrull. This was the revelation that reveals that Skrulls are on Earth posing as Earth heroes. Elodie Yung will play Elektra in season 2 of the Daredevil Netflix series. Elodie had previously played the ninja Jinx in G.I. Joe Retaliation. Elektra was played by Jennifer Gardner in the Fox film's of Daredevil and Elektra. Elektra is revealed to have been both an old college fling of Matthew Murdock's as well as another protege of Stick. 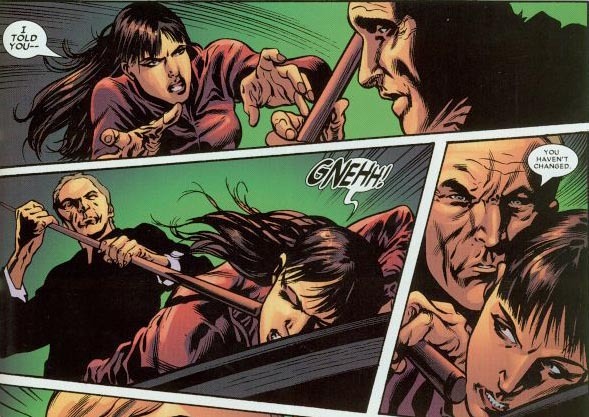 Stick had used Elektra's relationship with Matt as a means of trying to make Matt more violent and willing to kill to prepare him for the oncoming war with the Hand. Elektra is revealed to have been a Black Sky child that had been rescued by Stick as a child. He trained the child even though she was revealed to have terrible killing capacity. Elektra is sought out to be controlled by the Hand but in the end she betrays them to help Matt whom she loves. She is killed by the Hand but her body is revealed to have been placed in a stone chamber in order to be returned to life. Elektra is returned to life by the Hand as a special project of the leader of the Hand Alexandra. The other 4 leaders of the Hand are skeptical of the resources used on Elektra. In order to bring her back to life the last of the Hand's resurrection chemical was used. The Hand then needed to reagain access to Kun Lun where its founding members came from in order to get more of the chemical. The founding members of the Hand desired to live forever but were long ago denied access to Kun Lun by the leaders of Kun Lun. Elektra helps the Hand assassinate various members of the Chaste organization. However, when confronted by Daredevil she hesitates to kill him. She begins to remember her past life and begins to feel used by the Hand. Elektra kills Alexandra and tells the other founding members that she is now in charge of the Hand Organization. They grudgingly accept her leadership but are clearly worried about the new direction of the group. The Hand successfully regain access to a dragon from Kun Lun and begin harvesting it for the chemical that grants them resurrection. While they are doing this the Defenders assault them and blow up the building above site ontop of them. Elektra and Matthew Murdock are seemingly killed and buried in the explosion. Matthew is revealed to be alive in a covenant. Elektra's whereabouts and status have not been revealed.